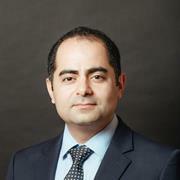 Dr. Tehrani has recently started his tenure-track research position at Temple University. Previously, he has served as an assistant professor of instruction from fall 2013 to fall 2018. His Ph.D. dissertation and post-graduation studies were mainly focused on the employment of molecular biology techniques in environmental engineering. Use of innovative materials and processes is his current passion and new area of research. Dr. Tehrani has received his Ph.D. from Temple University, department of civil and environmental engineering. He has published the first critical review on the source, fate, and toxicity of OH-PCBs in the environment. He was also the first to systematically study and publish the bacterial degradation pathways for OH-PCBs and genomic responses of bacterial cells exposed to OH-PCBs. He has extensively employed biotechnology tools in investigating bacterial degradation pathways for OH-PCBs. He is currently the chair of AEESP education committee. He has received his MS degree from the civil engineering department at Dalhousie University in Canada, where he studied arsenic removal from drinking water through adsorption mechanisms.